I’m sure you might be having snaps taken from digi cams or pictures which are pretty huge in resolution which you would like to compress and upload over net or send them to your friend or maybe use as a profile picture in Facebook. 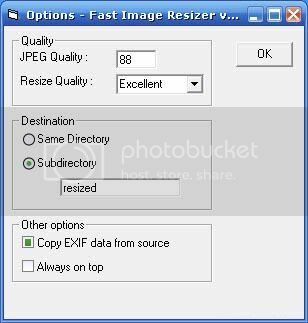 Most of us usually use Microsoft Picture manager to resize images and pictures. I found a great app- adionSoft Fast Image Resizer which allows you to quickly resize images and pictures in high quality. The software has an extremely user friendly interface. The software is freely available and works perfectly on Windows 2000, XP and Vista.